Chimp Research: The End in Sight? The good news is that the National Institutes of Health (NIH) has accepted the recommendations of an expert panel to cut way back on using chimpanzees in medical research. Not so good is that they’re still leaving the door open. The NIH has suspended all new grants for biomedical and behavioral research on chimpanzees and has set new guidelines requiring that the research be necessary for human health, and that there be no other way to accomplish it. The report from panel of experts said use of chimpanzees in government-funded medical research should be reserved only for studies where no suitable alternative is available or where testing on humans would be unethical, and only for life-threatening or debilitating conditions. The move will give a boost to the Great Ape Protection and Cost Savings Act of 2011, which both houses of Congress are considering. It will also boost consideration of a petition to the U.S. 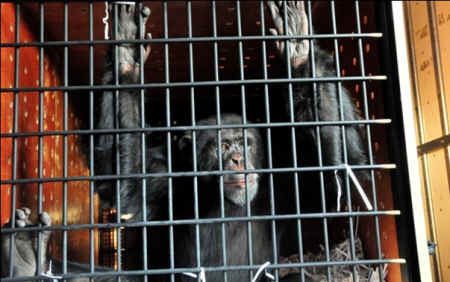 Fish and Wildlife Service for captive chimps to be declared endangered, as wild chimpanzees are. Once this exemption on captive chimps is removed, they cannot be used in research – nor in entertainment and as pets. Being “endangered” stops all of that. Research use of animals that are so closely related to humans should not proceed unless it offers insights not possible with other animal models and unless it is of sufficient scientific or health value to offset the moral costs. We found very few cases that satisfy these criteria. The report from the Institute of Medicine (IOM) was requested by Congress, which is considering legislation to ban research on chimps altogether. But the report doesn’t call for a complete ban. Instead, it gets into the usual ethical muddle of recognizing, on the one hand, that chimpanzees are so close to humans that it’s morally wrong to experiment on them, while arguing, on the other hand, that chimps are so close to humans that we still need to experiment on them. The committee felt ethics was at the core of any discussion about the necessity of continued use of chimpanzees in research. how much the chimpanzee model would accelerate or improve prophylactic HCV vaccine development. Ultimately, in other words, it’s not really about the fundamental ethics of using chimps in research; it’s about deciding when it might be unethical not to use them when the question is what’s best for humans. [The report] never presents a moral justification for conducting research on chimpanzees other than the necessity of their use in order to advance our scientific understanding and to potentially provide benefits to public health. Only human interests play a role in this justification … and, yet, as this Committee correctly notes, the problem of harms to chimpanzees and their moral status is what gave rise to the controversy to which this report is responding. The report repeatedly states how close chimpanzees are to humans in anatomical structure, in cognitive structure, and even in moral capacity to act altruistically. Given that a chimpanzee is as close to a human being as this report correctly indicates a chimpanzee is, it is hard to understand why the same level of protections should not be provided to chimpanzees as are provided to humans … The report never addresses this central issue. You can read the report from the IOM here. It includes links to an easy to read slide presentation. And the response from the group at the Kennedy Institute of Ethics is here. Our take on it all: An important step forward, but until chimps are given the specific legal right to live their lives free of human exploitation, the status quo still ultimately prevails. Incidentally, the European Union banned the use of chimpanzees in invasive research last year, leaving just the United States and Gabon as the only countries in the world that conduct these experiments.